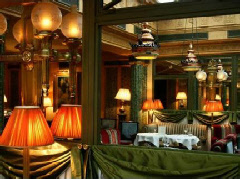 This iconic left-bank hotel, set in the heart of St Germain des Pres, was originally part of the Palace of Queen Margot. Its primary historical aspect, however, is that it was here that Oscar Wilde lived during the last few years of his life and finally died on November 30th 1900. Indeed, it was while in Room 16 of the then Hotel d’Alsace that he uttered the famous lines: 'My wallpaper and I are fighting a duel to the death. One or the other of us must go.’ The décor is much improved these days. Other 20th century visitors of note include Frank Sinatra, Salvador Dali, Grace Kelly, Richard Burton and Elizabeth Taylor. Five star rated, L’Hotel is situated on Rue des Beaux Arts and offers a restaurant (Michelin starred), bar, and 20 guest rooms in all. These are classified as Mignon, Bijoux, Grand and Chic. Also available is a penthouse suite with views across to the Church of St Germain.